FEB 21, 2012 Kathmandu – Many of us have totally forgotten Nepal and its unique history that remains in some collector’s album only. I was searching for someone that i know and found that she have contributed some of the history revealing pictures to a website. Here are few of them that i would like to share with you fine people around the world. The Nepal Picture Library is a photo archive that has been recently set up by photo.circle. It hopes to contribute to the study of Nepali photography, as well as generate knowledge and raise questions about how we can explore issues of memory, identity, and history through images. 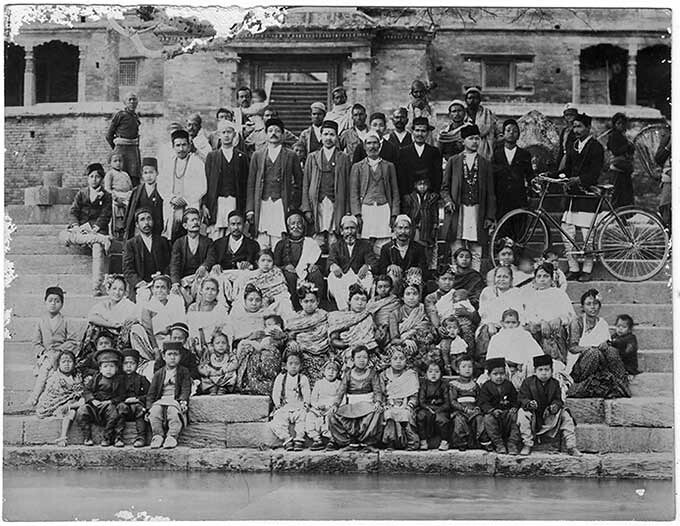 Retelling Histories is a collection of photographs from a cross section of Nepali family albums. The photographs are accompanied by texts that were written in most cases by the immediate family members of the people pictured in the photographs or the people who took them – sons and grand-daughters and great-grandnephews, telling stories from their own personal histories and reclaiming a long overshadowed collective past. NEW ROAD, KATHMANDU, CIRCA 1970 AD | Photo and text contributed by Sweta Baniya – A picture preserves life and the moments that have passed. When I stumbled upon this photograph in my family album, I did not recognize the young man in it. “Who’s this?” I asked Fupu, Dad’s older sister. “Tero bau pani chindinas?” she replied. Don’t you recognize your own father? 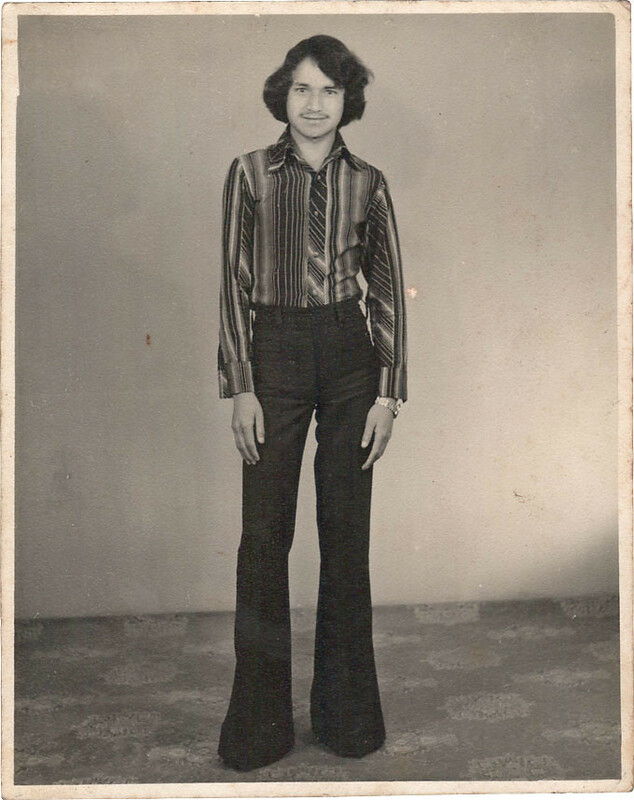 In the 1970s, Bollywood – and my Dad – influenced the fashion sense of his hometown of Thankot. He is twenty years old in this picture, taken at the Royal Photo Studio in New Road. When I asked him about the photo, he said, “Rishi Kapoor dressed just like this in the movie Bobby.” He was fond of bunking college to watch movies. My father was very particular about what he wore. He was always neat and clean, with ironed clothes, polished shoes, and long hair that covered his ears. In this photo, his shirt does not have a pocket: this is his own design. The bell-bottom pants covered rabbit skin shoes with two-inch heels. The Seiko wristwatch imported from Hong Kong cost around 850 rupees at the time, enough to buy a tola of gold. Now, my Dad is a giant with a big belly who does not care about how he dresses. I imagine his youth must have been his sweetest dream. 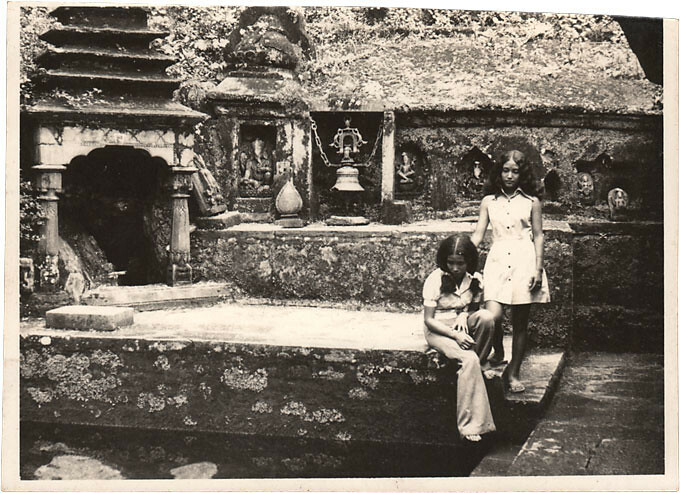 Godavari, Lalitpur, 1976 AD | Photo and text contributed by Snigdha Bhatta – My aunt Laxmi stares into the pond and my mother, Sandhya, stands guard behind her. They were very close, as can be guessed from this picture, taken in 1976 at Godavari Kunda. Godavari was a sanctuary for them – a place where the two sisters could be on their own and nobody would complain or nag them. They lived in Gabahal and it would take them an hour to get there but the distance never stopped them. My aunt always spent her weekends at Godavari. My mother tagged along and tried to soothe her. Their alcoholic father caused so much chaos in the family that they were having serious financial problems. My mother remembers how sad they were the day this picture was taken. “I don’t want to talk about it,” my aunt would always say. She would spend hours in silence, contemplating her reflection in the pond. She enjoyed watching the fish swim about freely, and envied them. The fish would dive and dart around and my aunt could do nothing but stare at them, sometimes crying uncontrollably. She felt chained. She must have felt like she was drowning in waves of self-pity. Her sombre expression hints at just how melancholic she was, just how desperately she sought freedom and independence. 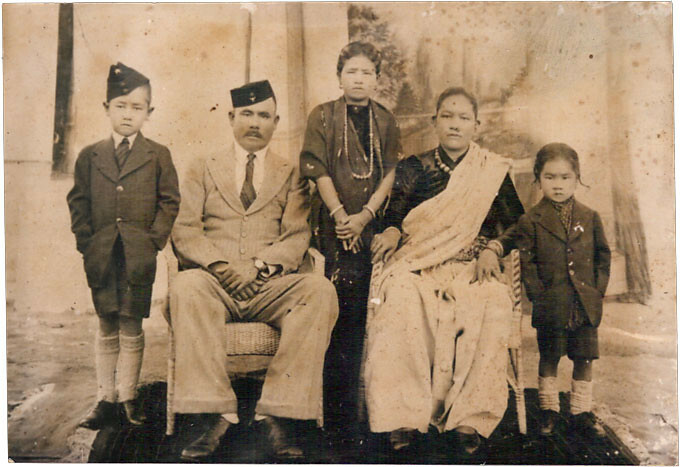 Shillong, India, 11 November, 1939 AD | Photo contributed by Bhimi Gurung | Text contributed by Muna Gurung – Aama found this photograph of her parents and her siblings in the attic of my grandparents’ old home in Jaare Khola, Parbat, tucked away with old clothes and dried corn. Soon the photo appeared everywhere. It was enlarged and framed and hung under the big clock in the living room. Another copy of it also sat on the altar in the prayer room, right in between the statues of Avalokiteshvara and Padmasambhava. There was one in the flap of the coffee table photo album and two more copies, each stuffed in an envelope, ready to be sent out to Aama’s siblings. When relatives visited, Aama would point out how tall her mother had been for a village woman or laugh at the matching mini-adult striped suits her brothers wore, or comment on how royal her father looked. She would reveal something new about the photo each time. Last year, she told me how baajey’s land, house, and medals were all divided between his two sons and how my mamas had sold baajey’s belongings to curators that sifted through villages, all for 10,000 rupees. This summer, Krishna mama gave Aama a new version of the picture. He had Aama’s headshot clumsily photoshopped onto it, a spurious proof of connection. “Well, you’re in the photo now,” I’d said to her as a joke. Although we laughed at its tackiness, I know she will always make space on our walls, albums, shelves for new copies. Maybe it makes this photo feel less like it is the only one of her parents, or maybe each reproduction is an opportunity for a new story. Guheswori Temple, Kathmandu, 1927 AD | Photo contributed by Narendra Lal Mankey | Text contributed by Kanchan Joshi – This photo was taken circa 1927 AD on the banks of the Bagmati river near Guheswori temple. It was taken during a puja of the Maskey clan from Ason tole. I have always seen this photo hanging in my grandfather Narendra Lal Maskey’s room. He was one and a half then (2nd row from bottom, 1st from right). The lady next to him was his mother. My grandfather’s sister and elder brother are also in the picture. Gorkha, Nepal, 19 March 1986 AD | Photo & text contribute by Ashok Adhikari – Every time Father saw my long hair he’d say with disgust—“You look like an ape! Get a haircut!” Mother would tease me about my narrow trousers. She’d say, “Do you want me to wash your leggings too?” There is a photo of my parents in the old album. Father has long hair in it. One day, when he bugged me to cut my hair short, I showed him the photo in which he is wearing a pair of tight trousers just like mine. He laughed, and said, “You thug!” That felt good. This photo was taken in Bhimsen Shrestha’s studio in Bhachhek of Gorkha. Bhimsen was an immigrant from the far west of Nepal. His studio, an hour’s walk from my ancestral home in Lapsibot, Gorkha, was the only photo studio in four Village Development Committees around. Father had been studying in Kathmandu before the wedding. The photo was taken shortly after the wedding. Father has grown a mustache, and hair long enough to hide his ears. He looks fashionable—like his Bollywood idols from the 70s and 80s. Mother comes off as the exact opposite—she seems a homely village girl. Her attire is simple, and her face full of apprehension. “I was still a school girl. But I had to leave home to enter a new family. A very different world. I was scared of your father,” Mother says. “You look like an ape! Go, get a haircut!” Father has never said this since I showed him the photo. Perhaps he will never say it again. 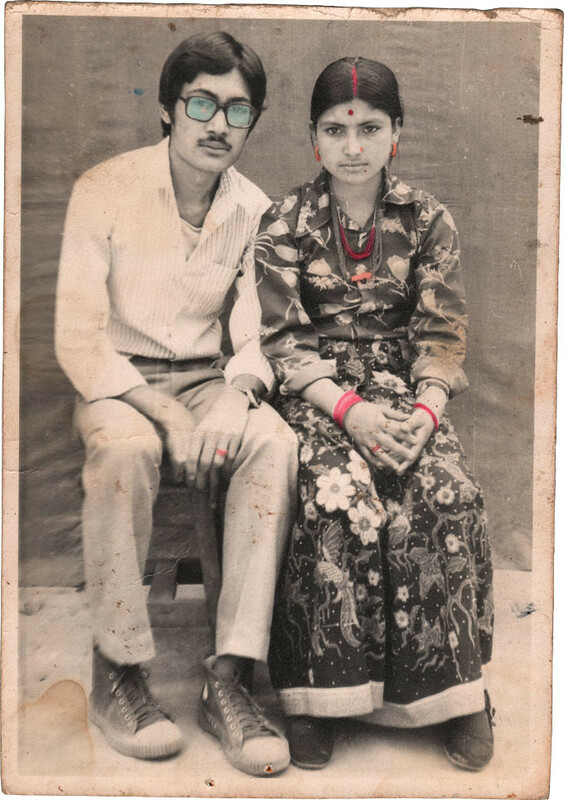 The Mukunda Bahadur Shrestha Collection is a new collection currently being digitized and archived at the Nepal Picture Library. It is a collection of photographs taken by 86 year old photographer Mukunda Bahadur Shrestha. Shrestha worked for the Tourism Department as a photographer for over 30 years. His collection includes an extensive range of imagery from all over Nepal from the early 70s to the late 90s. The Sugata Collection is a collection of photographs by Angarika Sugata. Sugata was born in 1911 in Germany. His long life was an odyssey through his own and the last century’s dark ages. He railed against his time and place, a protest that culminated in his war-time betrayal of Nazi Germany, when he risked his life and effectively ensured his rootlessness. His search for root as well as freedom took him to the East, first to India and then Nepal where he became a Buddhist monk.